Write what you know. Sometimes that theory provides some awful stories and sometimes it gets gold. Verano Place falls into the latter category. 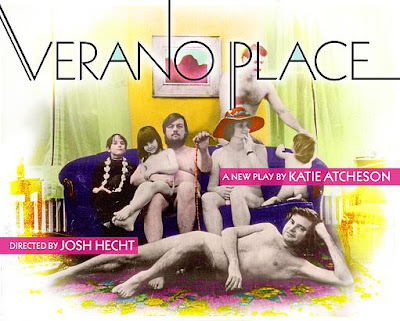 Inspired by playwright Katie Atcheson's parent’s open marriage, Verano Place chronicles the absurd life of Emily growing up in California. Emily 's parents are in a very open marriage where the new loves take precedence over their own children. With a story that seems only believable on a sitcom, Verano Place is a comedy for the nostalgia deprived. With excellent direction by Josh Hecht, the comedy plays up the heightened absurdity allowing you to laugh at the humor and be touched when Atcheson offers the sentimental moments. With characters including an over dramatic dad, a never seen sister, a fake bad girl best friend, a wild little brother, and an oblivious to life mom, it allows for Emily to be a real character in her crazy world. Atcheson took the quirks and allowed them to flourish. While you could say that some of characters hit close to home, they are developed incredibly well. Though there are bits that Atcheson could cut to reduce the length, the story is wonderful and the dialogue is witty and pointed. This is all about Emily's journey and Chet Siegel is simply excellent. She makes the best of her whacky situation and grows from it. Siegel stands strong and does an impeccable job carrying the weight of the show. As other lover loving parents Paul and Ruth, Bradford Cover and Helen Coxe couldn't be more opposite and more perfect. Cover’s comedy was big and over-the-top while Coxe was simple and subtle. As little brother Danny, Will Dagger brought a youthful exuberance that paired well with Siegel. Jessica Brown as neighbor Marcelle did a solid job, though she did stumble in and out of accent quite often. Josh Hecht proved his immeasurable talent as a director, taking great commend of Verano Place. Hecht guided this piece through the ups and downs and allowing it to breathe naturally. Verano Place featured a very smart and simple set by Reid Thompson. Thompson and costume designer Julie Michael offered the perfect mix of patterns, colors, and fabrics that defined the era. The one struggle the production did find was through the foley style sound design. To give the feel of certain objects, like ice in the shaker, being live, sound designer Elisheba Ittoop offered a soundscape that was supposed to be timed to the action. Unfortunately when it was off and didn’t sync, it just looked bad. Verano Place is a pretty solid production with much hope. But you can't help but make comparisons to Fun Home simply due to the time period and the familiar theme. Where this story goes next will be interesting to watch. Could be interesting to see it in tv series form.